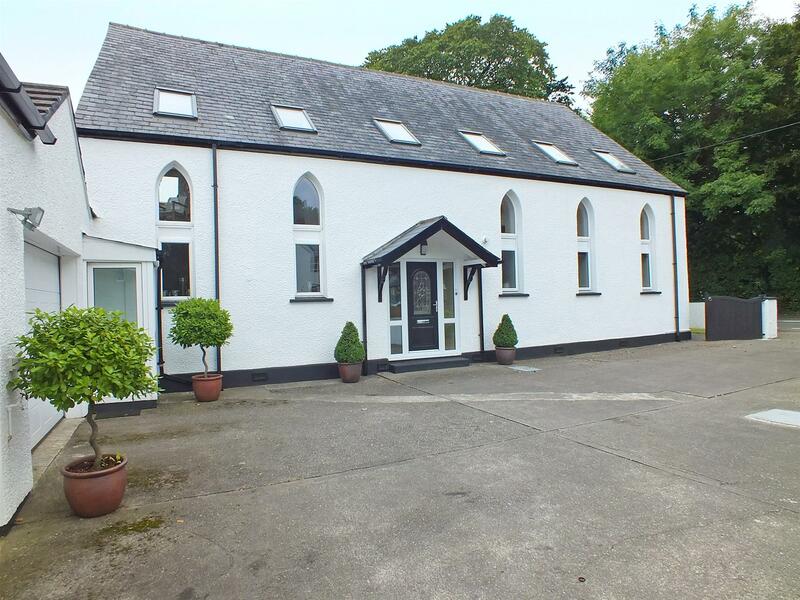 An Attractive Detached Chapel in a Handy, Central Location with Rural Views. Easy Access to All Areas Including Douglas, The Airport & King Williams College. On Main Bus Route Within Walking Distance of the Popular 'Hawthorn Restaurant'. 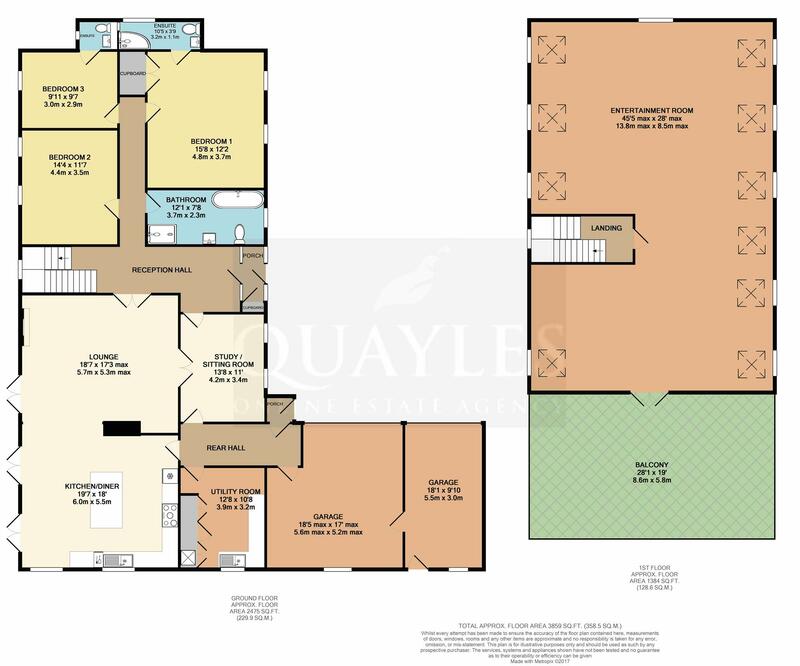 A Superb Layout with a Spacious Reception Hall and Separate Bedroom Wing. Study/ Sitting Room, Lounge & Adjacent Open Plan Kitchen, Dining & Family Room. Stylish Family Bathroom, 3 Double Bedrooms, 2 E/S - 1 Shower Room, 1 Cloakroom. Inner Hall with Large Utility Room off. Oil Fired Central Heating & uPVC Double Glazing. Fabulous Open Plan 1st Floor Entertaining Room with Paved Roof Terrace Off. 2 Large Interlinking Single Garages & Excellent Off Road Parking Facilities. Superb, Beautifully Landscaped Gardens with Lawns, Patio & Large Veg Plot. From Tynwald Hill travel out of St Johns towards Greeba, the property will be found on the right hand side of the road, being clearly identified by our For Sale board with plenty of off road parking. The property is located to the front of the nurseries. A canopied entrance and uPVC door with a decorative glazed panel and side lights leads into the porch, with a recessed cupboard housing the electricity meter and consumer unit. Wood effect, laminate floor covering. An oak door and side lights with frosted panels in a Celtic pattern lead into the reception hall. A spacious area with access to the inner hall and bedroom wing. A solid oak staircase with an arched window at the half turn provides a pleasing feature. Understairs cupboard and space for a console. Glazed, oak double doors lead into the lounge whilst a further glazed oak door accesses the study. Power point, smoke detector. A dual purpose room with two deep set uPVC windows providing an excellent degree of natural light. Matching wall and ceiling lights. Glazed oak doors lead into the lounge. A further oak door leads to the rear hall. A spacious room with uPVC double doors to the patio and a clear opening to the kitchen. Featuring a polished stone fireplace with a recessed multi fuel stove. Matching wall and ceiling lights on dual controls. TV, satellite and telephone points. A well proportioned, dual aspect room with ample space for a full size dining table and easy chairs to one side. Two sets of uPVC doors flood the room with natural light and lead out to the garden and patio. Distant hill views via two uPVC windows. The kitchen has been fitted with a superb range of classic oak fronted wall, base and drawer units together with contrasting worksurfaces incorporating a 1 1/4 stainless steel sink with a lever mixer tap. A centre island provides a sociable seating area with deep drawers, wine racking and a pull up power tower. Integrated appliances include an 'Electrolux' dishwasher and fridge; 'Rangemaster classic 90' electric range style cooker and five ring ceramic hob, two ovens, grill and matching extractor above. Neutrally coloured background tiling and quality 'Amtico' tile effect floor covering. Recessed LED downlights on multiple controls. Smoke detector. A glazed oak door leads to the rear hall. A useful area with coat hooks and a uPVC door and porch leading to the parking area. Doors to the utility, garage and study / sitting room. Smoke detector. Power points. Oak effect laminate floor covering. A large room fitted with modern, oak effect base units together with a tall storage unit and contrasting worksurfaces incorporating a single drainer, stainless steel sink with a swan neck lever mixer tap. Splashback tiling. Space for a fridge freezer and plumbing for a washing machine. Built in airing cupboards and recessed 'Worcester' oil fired boiler. Easy care vinyl floor covering. A uPVC window looks out across the garden to the hills beyond. Smoke detector. Smoke detector. Double power points. Oak doors access all rooms. A truly spacious room with a tiled floor and contrasting tiled walls. Fitted with a contemporary suite of large double ended panelled bath with central mixer taps, push button flush WC and a wall mounted basin with a steam free mirror above. Walk in, glass fronted shower area with a fixed over head rose and wall mounted spray. Mirror fronted vanity unit. Deep set obscure glazed uPVC window. Recessed LED downlights. Chrome heated ladder style towel warmer / radiator. Space for a tall boy storage unit. Extractor. A spacious double room with room for a 'Super King' size bed if required, along with free standing furniture. Two deep set uPVC windows enjoy a pleasant outlook over the side garden. Coved ceiling. A double room, again with a deep set uPVC window. Space for freestanding wardrobes, drawers etc. Coved ceiling. Door to the en suite cloakroom. Part tiled to complement the glossy white vanity unit with a built in WC and top mounted basin. Wall mounted mirror. Small obscure glazed uPVC window. Ceiling spotlight fitting. Tiled floor. A superb room with ample space for a 'Super King' size bed and furniture. Deep set, recessed built in wardrobes with a hanging rail and high level shelf. Two deep set uPVC windows. Door to the en suite shower room. Part tiled walls complement the floor tiling and aqua boarding within the large walk in shower area with a fully plumbed unit and extractor. Push button flush WC and vanity unit with a top mounted basin and illuminated mirror above. Chrome heated ladder style radiator / towel warmer. Obscure glazed uPVC window. Recessed LED downlights. A pleasant area with a view of the garden via the arched window. Natural light and ventilation provided by a 'Velux' roof light. Exposed beam, modern light fitting and smoke detector. A glazed oak door leads into the open plan entertainment room. A fabulous open space featuring restored decorative A frames, 'Velux' roof lights, arched uPVC windows and a gable window to one side. Currently laid out as a games room with a separate seating area leading out, via uPVC double doors to a large roof terrace. Brushed steel pendant lights complement the original woodwork. Oak effect laminate floor covering. Multiple power points. Potential for numerous uses. NB Measurement includes the enclosed stairwell. A fantastic space which enjoys much sunshine being south facing. Paved with glass and stainless steel balustrades Enjoying hill views across the neighbouring properties which are barely visible when seating. External light and cold water points. Wooden planters with griselinia hedging provide a useful screen. A private garden which has been established by the current owners with many flowering plants and shrubs. The large shaped lawn is primarily to the west side of the property and extends to the rear. A further area has been established as a vegetable bed. The patio is accessed via steps and a ramp. Garden shed. Oil storage tank. Outdoor lighting. Cold water point. A large area which leads directly to the garages with ample parking and turning space. A concrete pathway leads around the side and rear of the property. An L shaped area with an electronically operated, up and over panelled door and a timber framed window to the rear. Light, power points and smoke detector. Door to garage two. A generous single, again with an electronically operated up and over panelled door. Shelving. Light and power. Rear timber framed window and part glazed wooden door to the rear of the property. Mains water and electricity. Private drainage. Oil fired central heating & uPVC double glazing.